Ken Tyler: One of the most important projects that we had completed with Robert Rauschenberg, it was called Stoned Moon, and this is the largest print from that series, called Sky Garden. In order to create this print in the first place we had to laminate three stones together to get a size that would be eighty-nine inches by forty-two. You can see the seam line that runs across there [one-third of the way down] and across here [two-thirds of the way down]. I think the print is significant for more reasons than just its size. In order to do this project we worked around the clock for about four weeks. We produced some thirty prints in that series, and each time Bob made a print he kept making one larger, and larger, and larger. So this became the crescendo, this was the big blast at the end, like the 1812 Overture when the cannons go off. This print probably represents the largest we are ever going to print a lithograph, because of the human problems involved. The printer can only reach so far when he is leaning over the press bed, and on this particular print I had to have two spongers on one side, two spongers on the other side of the press, and I had to use a second printer that had a charged roller ready for me at all times, so that we could get the volume of red that was required on this print, to give the richness that you see in these areas along the right and the left. The top part, of course, is photographically done from Rauschenberg’s original collages, and then touched up by the artist himself. And I think it represents just how far you can push the medium, and it represents one of the things we always wanted to do and that was give the artist a scale that would command a position on the wall as paintings do. Hi Ken, that is really fascinating… I’m wondering where you get the lithographic stones? That is an excellent question – some of the stories around Ken’s lithographic stones are really fascinating! Jasper Johns’ Color numeralseries, for example, was printed from stones that Ken salvaged from a building site in the back of a beaten-up VW! You can find more details about this project here: http://nga.gov.au/InternationalPrints/Tyler/DEFAULT.cfm?MnuID=2&ArtistIRN=17689&List=True. Thanks for your question – keep them coming! Wow! Gorgeous photographs of the young Robert Rauschenberg! 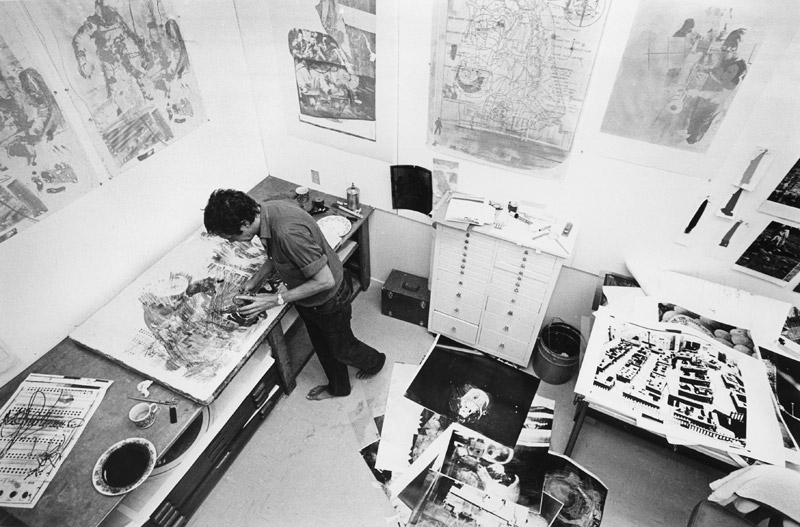 You can see more photos of young Rauschenberg in the ‘Photo Archive’ section of our Tyler website: http://nga.gov.au/InternationalPrints/Tyler/Default.cfm?MnuID=11.